One of the best ways to get organized is to delegate household chores to your children. One of the best ways to motivate your children to co-operate is to provide finely targeted bribes. The current bribe currency around here is Webkinz, but they’re a bit pricey, especially in these financially stricken times. So, if your household is in need of a little extra motivation, why not make a few of your own bribes. Cast on 30 stitches to a size 10 [US] circular needle. Mark the beginning of the round. Knit two rows knitwise. Knit seven rounds without increasing. Thread through the tail with the crochet hook and pull through and tie off on the wrong side. Knit eight I cords with six stitches, one inch shorter than the length of a standard pipe cleaner. Insert pipe cleaner with a crochet hook and pull through the centre. Fashion each end of the pip cleaner into a loop and squeeze the pointy end tightly with wire cutters. Sew the loose end on the yarn at each end to cover and flatten the ends. Atatch home made or shop bought pompoms to one end. Sew the bald end to the body of the spider on the outside [right side] with invisible stitches. Sew on eyes and pompom mouth. Secure contrasting coloured pipe-cleaner for the mouth and make sure to neaten the inside ends so that they don’t poke through = tie the ends together on the inside, twist off and add a blob of glue so that if they do move they will not be sharp. Stuff the body and sew contrasting circle of fabric to the underbelly. Clearly, they motivate lots of children, not just mine. Now with the easy part over, it’s down to the real business. 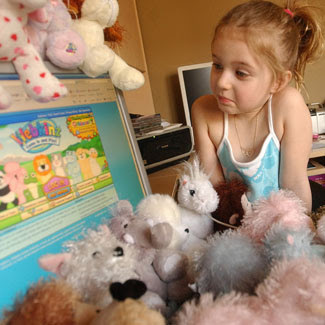 If your children have an eye for detail, then a Webkinz logo is an absolute must. First pick a language, an unfamiliar one. Learn two or three lines, together with an authentic accent. Secondly, decide upon which type of disguise best suits you. Ideally this should be a disguise that is credible, no Chuck E Cheese Mouse suits please. Find you finest pair of small sharp sewing scissors and secret them about your person. Then, take yourself off to the local Hallmark shop or any other fine retailer of the much favoured Webkinz. On arrival, blend discretely amongst the other legitimate shoppers. Do not draw attention to yourself by acting oddly. Wait patiently for the right moment and then discretely hack off the nearest Webkinz label available. Return the bald Webkinz to the back of the shelf and run like hell. Do not worry if you are caught as you have the best defense in the world, a real justification that cannot be thwarted by logic. As I may have mentioned earlier, this tackle is not for the faint hearted. If you find that you’re not a ‘Mission Impossible’ type, your second option is to take careful note of the Webkinz that already enjoy household space at home. Wait until all junior persons are absent from the home, preferably for a long period of time, such as during school and then determine which Webkinz is for the chop? Take your sacrificial Webkinz and slice off it’s leg, unpick the Webkinz logo and sew it neatly on the new and perfectly unique Webkinz of your own design. Before the children return home, nip outside and find a rock. Smash your front window with the rock from the outside to make sure that the broken glass falls on the inside of the floor to prove that you had no defense against the wicked, Webkinz robber who burgled the house whilst they were away. Either option should be completed early in the morning. On completion, early in the morning, you shall now have the rest of the day to complete your mission. First it is necessarily to acquire a massive brain such that you are able to hack into the Webkinz site on-line. Once hacked, it is then essential to steal a legitimate Webkinz code. Having stolen the Webkinz code, all you have to do is to perfectly forge the Webkinz papers of authenticity, insert into a plastic Webkinz liner. Carefully wipe clean of all incriminating evidence, such as finger prints. Be sure to wear latex gloves. Attach code package to the Webkinz, with a pale blue ribbon that you saved from a previous purchase. I think this is probably where I went wrong? Anyone want a green spider perchance? I’ll forward the ribbon later on, if I ever find it. Posted on February 2nd, 2009.